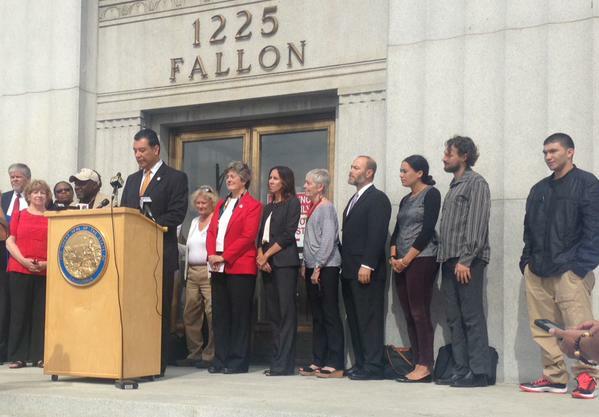 On August 4, 2015 at a press conference in front of Alameda Superior Court, California Secretary of State Alex Padilla and LSPC Executive Director Dorsey Nunn announced that the Secretary of State would no longer deny voting rights to Californians serving post-release community supervision and mandatory supervision – meaning that 60,000 more formerly incarcerated people can vote in California! The announcement was a result of years of advocacy and litigation by LSPC and others. The California Constitution only denies the vote to people “imprisoned or on parole.” In February 2014 we sued Secretary of State Debra Bowen for additionally disenfranchising people serving sentences in other categories of supervision following incarceration. Plaintiffs included LSPC Board Of Directors member George Galvis, Dorsey Nunn, All Of Us Or None, the League of Women Voters of California, and 3 individuals. Co-counsel included LSPC Policy Director Jesse Stout, the American Civil Liberties Union, the Lawyers’ Committee for Civil Rights of the San Francisco Bay Area, and the Law Office of Robert Rubin. In May 2014 the Superior Court of Alameda County ruled in our favor, but the Secretary of State appealed. In November 2014 Alex Padilla was elected Secretary of State. In January 2015 amicus briefs were filed in favor of our plaintiffs by San Francisco Sheriff Ross Mirkarimi and the Brennan Center for Justice. Finally, in August 2015, the Secretary of State agreed to settle the case, withdraw the appeal, and restore voting rights to everyone on realignment supervision. Read the full history of All Of Us Or None’s voting rights campaign and our press release about this historic victory. CA Secretary of State Alex Padilla announces restoration of voting rights for 60,000 formerly incarcerated Californians, with LSPC ED Dorsey Nunn, LWV-CA President Helen Hutchinson, ACLU attorneys Lori Shellenberger and Michael Risher, Lawyers Committee for Civil Rights attorney Dana Isaac, LSPC Policy Director Jesse Stout, and plaintiff Martin Cerda. Photo Credit: ACLU of San Diego.